Thank you for the overwhelming support of the plaid Trickster dress, and/ or of my wielding power tools in my garment photos! Who can't use a good laugh every now and then? Unlike the plaid dress, I really loved the pattern envelope pic for McCall's 5879. It wasn't until I picked up the pattern that I realized you put it on by slipping it over your head. Is it just me, or does it seem impossible that the dress could fit so well around the bust and still be wide enough to slip over one's head? Well, call me curious. I moved this dress to the top of the queue. I usually switch my personal scent in the summer to something lemongrassy or grapefruity -- if I smell like citrus, it must be summer. 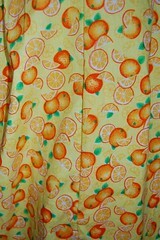 So why not look like citrus, too? I pulled this fabric from last summer's stash and there were just scraps left after cutting this dress (the bodice is self-lined). Honestly, it's a bit loose in the bodice, and a bit long. When I pinch an inch in width from center front, the darts fall a little better and it feels less baggy (might look OK on Clementine but she is about 1" around the bust than I am). 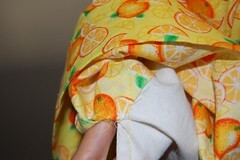 If I sew this again, I will modify the bodice accordingly and insert a zipper to get in and out. I like the pleated skirt a lot -- full and comfy. One reason I tackled this pattern is that the bodice has bust pleats, kind of like my beloved Rooibos. I've done tissue fits on Rooibos and gone through 3 iterations of that front bodice. And I needed a break. So, once I get this McCall's bodice perfect, I will use it to flat pattern fit Rooibos. I hope. A TRUE summer dress. Simply darling-both print and cut. No this one I like. Very fresh and summery. I feel cool just looking at it. It seems to fit you well. Can't wait to see the zip version. Holy cow! The detailing there with the pockets is exquisite! Also cool to see the inside of the Common Thread again!! I have found that I can pull a dress over my head without unzipping it first - but assumed it was because the dress doesn't go in much at the waist (since I don't). lovely dress, i ♥ french seams now too! i'm working on a hawaiian shirt for my FIL and the whole garment has been done in french seams so far except the arm holes, yay! So cute and so cool looking. I love a simple dress with extra details. I love your dresses, and more so the anecdotes. I remember reading about one you created last year during that Vegas vacation. How quickly the time disappeared! You are so amazingly creative and clearly talented in many areas beyond our exploits in youth. it looks comfortable, I like things a little roomy in summer but may be you could add a zipper if you make it again! That's a fun print! And the colors look really good on you. I've shied away from zippers for years. When I did them they always turned out fine but it took me SO long. I might actually try this one. What size did you pick? I think we've compared sizes before and are pretty close to the same, maybe I'd try the next one down. i want someone to show me how to sew pockets like that!! i like your over the top print too! we have a common thread sewing studio store here too! is that weird or is there one in every hip town? 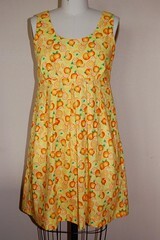 Love this dress and what you did with french seams! I am planning to make the strappy version for my daughter--but am totally perplexed about the sizing. Did you go by your usual dress size or follow the McCall's measurements? My daughter usually wears a 6 or 8, but her measurements put her in a 12 or 14 for this pattern! What was your experience? @JoanneM - Thanks, it feels very apropos for the season when I wear it. @RiAnge - My MOTHER complimented this dress, despite my little misgivings. I told her about my ideas to slim it down a bit, but she felt strongly that it worked well exactly as it was! @Kyle - I don't take a lot of "detail" photos, do I? Just did the same french seamed side seam pockets in the Mociun knockoff. So not intimidating now. @Violet - Honestly, I am not sure the color is as flattering on me, either, now that I see that photo of me with the large group. But it feels so very summery that I don't know that I notice! 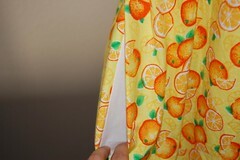 @bookwormbethie - I can't imagine french seaming armholes, but in most men's RTW shirts, flat-felled seams rule the day. @Edris - Simple as they get! 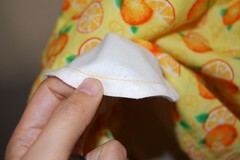 Though the pleats took a LONG time to sew, now that I remember it. @House of Payne - Thanks for stopping by! I love when you do. Three summers now I've been sewing summer dresses and they have served me well. Love you, too!!! @quelle - A local boutique carried a brand of fragrances called Demeter, and they made all kinds of body scents in a bottle, like Cracked Leather and Coffee. My fave ever is Quince -- so very summery. @poppy - The ultimate summer quandary -- total ease or fitted chic? @Sarah@Neoteric.Traditional - Picked the smallest size, I think a 6. Go for it! Good stuff. @heather - The pockets aren't so bad once you've done them once. I wonder if there's a photo tutorial out there somewhere? @Doctor Mom - I went by finished bust measurement -- smallest size, which I think was a 6. It was about 2-3" larger than my actual bust measurement.